Yellowstone is the first and oldest national park in the world. It has been impeccably preserved to protect its awe-inspiring geographic features like spouting geysers, hot springs, and the vivid Grand Canyon of the Yellowstone River, among many more. Luckily, this park is open the entire year to enjoy, with many outdoor activities regardless of which month you visit. Yellowstone National Park combines all the best aspects of the winter season. A blanket of snow covers the land while geysers are still active, spraying water and steam high into the brisk, invigorating air. Late fall to early spring, the park becomes an ivory playground with plentiful wildlife like elk and bison often seen roaming through the wilderness. There are several plateaus and landscapes throughout the park, varying in elevation from 7,000 to 10,000 feet above sea level. The amount of snowfall at the park increases at higher elevations. Trails used for traveling in the spring, summer, and fall can now be utilized for cross-country skiing and snowmobile rides. There are many recreational options during the winter from guided snowmobile adventures to solo snowshoeing or ski trips. Winters in Yellowstone have a variable amount of snowfall, depending on the elevation. Snow may fall here any time of year, and the park averages 150 inches annually, while mountainous areas above Yellowstone Lake may get twice as much snow. Winter temperatures generally range from zero to 20-degrees F. It is not unusual for it to drop well below zero, especially at night. Wind and storms can change direction suddenly when hitting through valleys or against elevated terrain. Come prepared for severe weather by bringing a hat, plenty of warm clothing to wear in layers, gloves, and thermal hiking boots and socks. Sunscreen and sunglasses are also a good idea to block out reflective rays from the sun. The winter season at Yellowstone National Park begins mid-December and ends mid-March. The North Entrance road at Gardiner, Montana to Cooke City and Silver Gate, Montana at the Northeast section of the park (State Route 212) is the only road plowed and open for vehicles. There is no way to get beyond Cooke City except by snowmobile. Drivers must ultimately enter and exit the park through the North Entrance. This road may be closed temporarily in extreme weather conditions. Snow tires or chains may be required in some areas. There is another transportation option for access to Yellowstone. 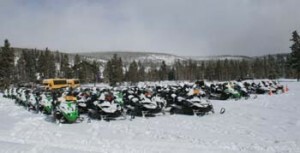 Many visitors come into the park from the west or south on commercial snowcoach or snowmobile rides. There is a daily limit on snowmobiles and snowcoaches entering the park, so earlier in the day you get started, the better. Private snowmobilers without guides are not allowed in. Off-road snowmobiling is also prohibited.